Apple CEO Tim Cook today opened Apple’s fall iPhone event with a touching tribute to ex-CEO Steve Jobs. It’s fitting. The stage Cook stood on, after all, was the focal point of a new theater bearing Jobs’ name. Watch, according to Cook, has grown 50 percent over the previous year. It’s now the number one watch in the world, surpassing even industry mainstays, like Rolex. Its heart rate monitor boasts the same claim. 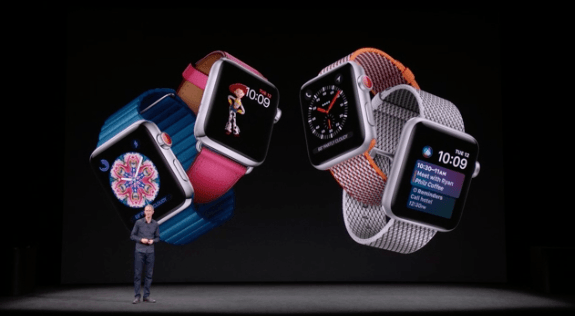 As part of the Apple Heart Study, Apple has three updates pertaining to the heart monitor in all Series 3 Watches. The first is an enhancement to the heart rate app, which you can now see on your watch face and for the first time, tracks resting heart rate. A second new feature notifies those who don’t appear active, but have an elevated heart rate. And finally, Watch Series 3 also tracks heart rhythm, a tool that could provide early detection of arrhythmia — specifically atrial fibrillation, a leading cause of stroke. Perhaps the biggest announcement though, is built-in cellular. This is was a much-anticipated development, and one we weren’t sure we’d see this year. Better still, it doesn’t require a second phone number, much like similar Android models. Another new development is Siri, who can now talk on the Apple Watch. Oh, and did we mention there’s calling now? The future is here; you can make calls from your Apple Watch, sans iPhone. And with all of these new features, Series 3 Watches are the same size as their predecessor. We’ll also get new bands, and exclusive new colors. Pricing info is as follows, $249 for the Series 1, $329 for the Series 2, and $399 for the Series 3. You can preorder yours on September 15, for delivery on September 22. Apple’s newest streaming box features a handful of upgrades designed to optimize performance for sparkling 4k HDR content. It starts with an A10X fusion chip, the same one powering the iPad Pro. From there, you’ll see 2x CPU performance, 4x GPU performance, and a new version of tvOS to boot. So far, 4K with HDR is available on iTunes from 20th Century Fox, Lionsgate, Paramount, and more. And for the time being, 4K films will be the same price as HD. If you purchased an HD movie recently, Apple’s going to upgrade your purchase to the 4K version, free. Live sports, tighter integration with Photos and HomeKit, and thousands of games and apps on the App Store round out the experience. The 32GB Apple TV 4K will set you back $179, $199 for the 64GB. The iPhone is undoubtedly what we came for. iPhone 8 will feature three color options: space grey, silver, and a beautiful new gold finish. Each of these will get a 50 percent deeper strengthening layer that’s microscopically sealed for dirt and water resistance. Powering Apple’s newest iPhone is the A11 Bionic chip, a 6-core CPU with 64-bit performance. It also has a 3-core GPU which stands to benefit the upgrade to Metal 2 in macOS High Sierra for better gaming, specifically games in 3D and VR. For most of us, the smartphone camera has been an extension of our daily lives that only seems to get better with each new release. Apple’s new flagship is no slouch in this department, either. 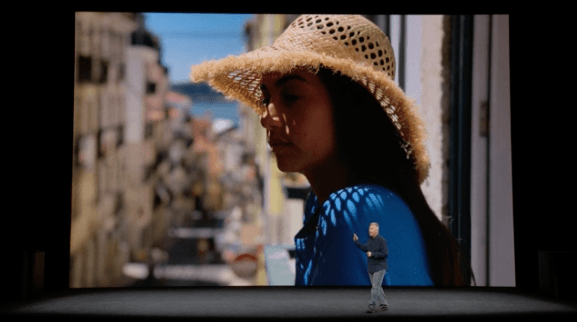 An all new 12-megapixel sensor with advanced color filters that provide better color saturation and deeper pixels with a higher dynamic range of color. A suite of new software tools improves Portrait Mode by adding lighting effects like studio or natural light, and better bokeh affects. Video gets an upgrade too, now allowing you to shoot in 4K at 240 frames-per-second. A new gyroscope, accelerometer, and factory tuning bring AR to the iPhone in a big way. Tighter integration with ARKit, and a new GPU that renders graphics in 60 frames-per-second is a boon to Apple’s otherwise lacking AR capabilities in preview models. Some of these AR offerings will make their way to the App Store later this month. Wireless charging, as we’d previously reported, is next up. Both iPhone 8 models use wireless Qi charging. We feared this would come with strict stipulations, such as a proprietary wireless charger, but Apple announced partnerships with major accessory makers, like Mophie, meaning we’ll get to save a bit of cash in the process. Both new iPhones are available in 128GB and 256GB versions. The former starts at $699, while the latter runs $799. You can preorder them this Friday, September 15. In a word, it’s gorgeous. It’s engineered to be both water and dust resistant and comes in space gray and silver. iPhone X also features the new Super Retina Display. It’s 5.8-inches, with 2436 x 1125 resolution, and 458 ppi — the highest pixel density in an iPhone, ever.The OLED screen has great contrast, it’s thin, and offers some of the best resolution on any flagship device. Dolby Vision, 3D Touch, and over 1,000,000:1 contrast ration make this device a sight to behold. Behind this gorgeous screen is a tap to wake feature that gives you a new way to wake the iPhone, a much needed feature since iPhone X no longer has a Home button. With an edge-to-edge screen, though, it’s a worthy tradeoff. As for Siri, there’s a larger button on the side to wake her, or you could always just use “Hey Siri” to summon her with your voice. But what about the fingerprint sensor? Well, you don’t need it anymore. Face ID needs only to look at you to unlock your device, no fingerprints required. Every time you glance at your iPhone one of several front-facing sensors scans your face and creates a mathematical model in real-time. As we reported previously, the feature is quite advanced and could be a real game-changer in the industry. All of this wizardry runs seamlessly behind the scenes using an A11 neural engine, literally a neural network in your phone. It’s dual-core, and can perform over 600 billion computations per second. It’s also highly adaptable. It works during the day, or at night; whether you’re wearing a hat, or not; or even if you grow a beard or decide to sport glasses. With the fingerprint sensor, Apple claims the chances are 1 in 50,000 that someone with a similar fingerprint could unlock your device. With the Face ID, it’s now 1 in 1,000,000. 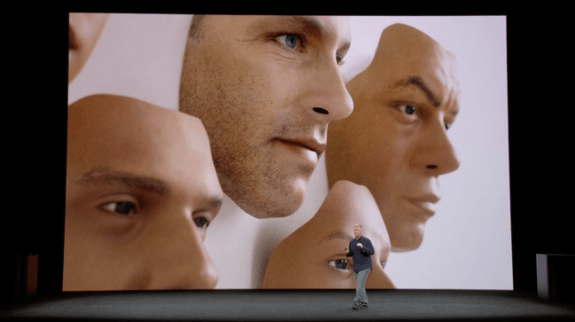 Apps like Mint, OnePassword, and eTrade will all work with Face ID, much like they did with its fingerprint-sensing predecessor. It might also be the fastest phone on the market. And what are we going to use all this raw power for? Creating Animoji, of course. Animoji are emoji that use AR to move realistically with your facial movements. Poop Animoji, here we come. As far as cameras, the iPhone X features two 12MP sensors as well as the same tuning for AR and lighting features of the iPhone 8, including Portraight Lighting on the front-facing camera. If that gets you excited to take more selfies, it gets even better: Portrait Mode now works with the front-facing shooter as well. If you’re worried about a hit to battery life, don’t be. Apple claims the iPhone X has two hours of additional battery life than the iPhone 7. The iPhone X comes in two sizes: 64GB and 256GB. It starts at $999. You can preorder yours October 27, and they’ll ship November 3.